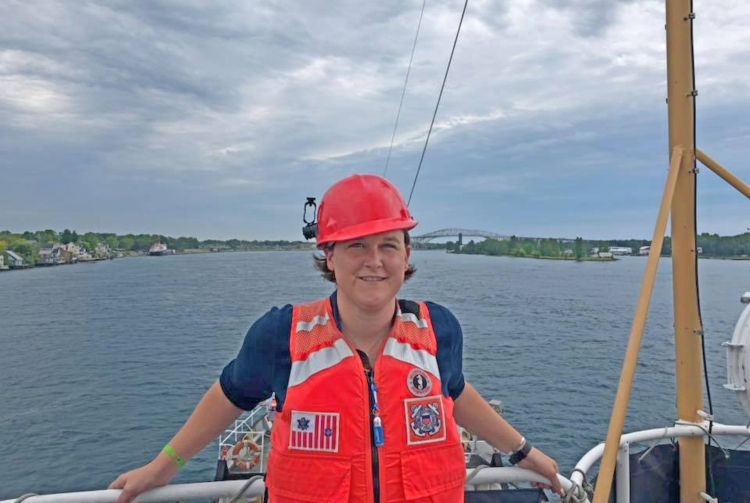 Margaret Aiken explores Port Huron from the water. "I love that it has been my home my whole life," she says. "No matter how far away I've roamed, my family and my home have always been here." Margaret Aiken has a passion for education, art, and history. Her new role as director of the Port Huron Museum suits her perfectly. Aiken, a Port Huron native, says she's always had a strong love of learning that was instilled in her by her parents--especially her father, Dr. Timothy Aiken. Growing up in Port Huron, Aiken, until third grade, attended two elementary schools so she could learn French, then went to University Liggett for middle school, and Phillips Exeter Academy boarding school before heading off to Yale for her undergraduate work. "He thought that education was the most important thing a parent could give a child," Aiken says. "He said, 'You know what, Margaret, once you get that education, no one can take it away from you--you can lose your Margaret Aiken takes a ride on the water.health, you can lose all your money, you can be homeless, you still won't lose the fact that you have that education,' so he felt like that was something really worthy of investing in." When she saw the job posting for museum director in Port Huron, she knew it was time to come home. She returned to the Port Huron region after 23 years away, ready to fulfill her father's legacy of giving back to the community. Aiken wants to share her excitement for learning with as many people as she can, especially children. After studying art history in France and at Yale, she wants to share the wealth of knowledge she's gained with others. For the last eight years, she's worked in education at art and science museums around the country, served as a teaching assistant, a mentor and as a coach, making a difference in thousands of lives. 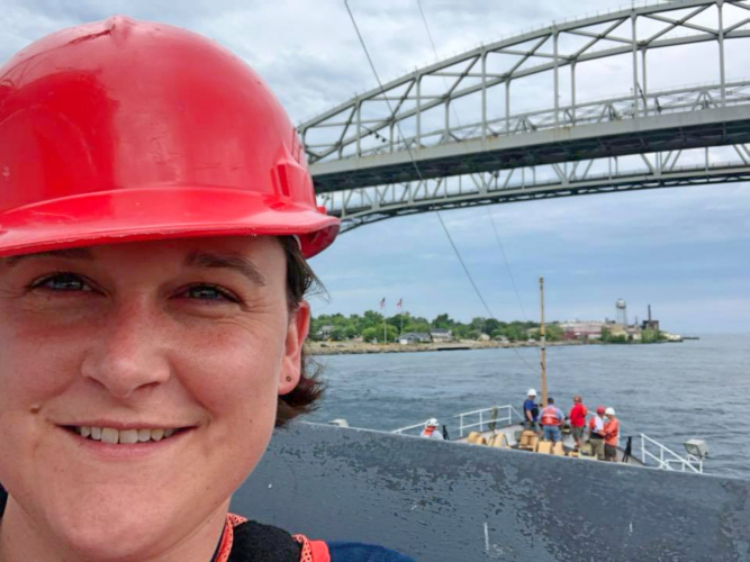 As museum director, Aiken is eager to share the stories of the city and its ancestors, and find a way to keep people coming back to the museum's five sites--The Carnegie Center Museum, the Huron Lightship, Fort Gratiot Light Station, Thomas Edison Depot Museum and Fort Gratiot Hospital. Her No. 1 priority is to make each location live up to its full potential. "It's like a sleeping bear that needs to be awoken," she says. 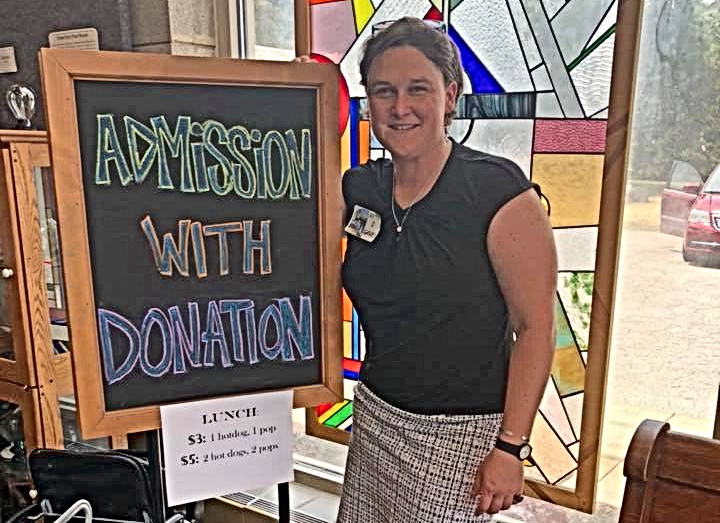 One of her first goals is to create an exhibitions committee for the museum that includes board members, staff, volunteers and community members. These new museum exhibits would be curated by the community and make them more relevant for those who come to visit. Those interested in participating should contact the museum. 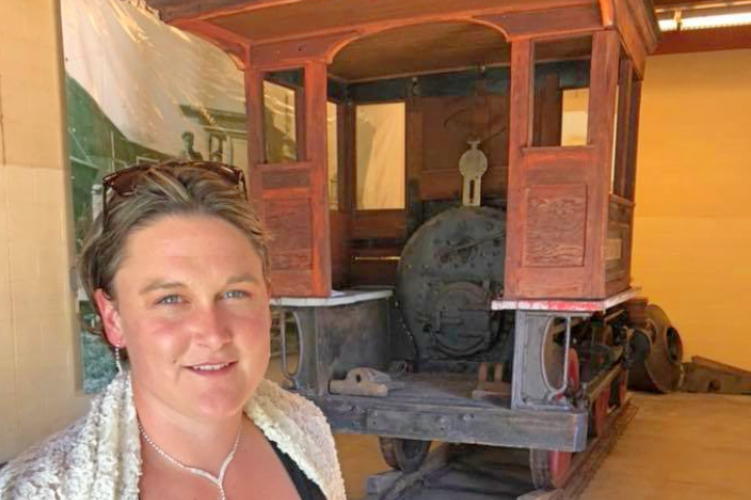 Margaret Aiken with the Daniel B. Harrington steam locomotive. "There are so many amazing people and organizations that need to be documented and celebrated," Aiken says. A second goal is to improve and increase collaboration and partnerships with other nonprofits and community organizations. Working together the organizations could share resources, like volunteers and programs, or space, not necessarily money. "There's got to be a way for us to work together on exhibitions and programs to really make both organizations shine," Aiken says. In her first days as museum director, she received a lot of feedback from people who say they've been to the museum once in their life, or never at all. Aiken says she had really only visited once, during Pioneer Days as a third grader. That's a statistic she really wants to change. "I want to make them known as destinations--extraordinary destinations for fun and learning--both here locally and statewide and even nationally--because I feel like there are these hidden gems," Aiken says. She is eager to tell the stories of the people who live--and have lived--in the area. People whose stories deserve to be told. "For me to be able to share experiential learning opportunities and my curiosity and to encourage people to learn new things… that's why I exist in the world," Aiken says. That is part of the reason she chose the job at this history museum. "I think what was a lightning rod moment for me was two weeks into the job when I realized how history museums are different than art and science museums," she says. "In history museums, your job is to 'tell the stories of the living and the dead, through personal objects, historical records, archaeological artifacts, newspaper records, and oral histories,' it is an incredible responsibility and a privilege to be the keeper and teller of those stories here in Port Huron and St. Clair County." Aiken wants people to find a reason to keep coming back to the museum and enjoying something new, whether it is a program, event or exhibit. History, she says, needs to be relevant. And there are many staff members and volunteers who are ready and waiting to make each location shine, especially the One of Margaret Aiken's first days on the job was dedicated to the Big Give, a day to support nonprofits.Carnegie Center, which is celebrating its 50th anniversary in 2018. When Aiken is not busy planning the future of Port Huron's history, Aiken loves exploring the Blue Water region, notably spending time on Lake Huron. Some of the other places she enjoys visiting are the St. Clair County 4-H Fair, SandFest, The Raven Cafe, ChinaLite and Chicken in the Rough. "After years of 'coming back home' for holidays, and summer vacations, I have finally returned and I couldn't be happier."